Does Trump recognize the limits of US power? Trump’s new world order comes straight from The Godfather. 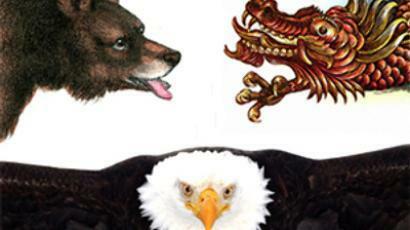 There are three global powers: the US, Russia, and China. None of these powers can militarily defeat either of the other two, and even an alliance among two of them would have trouble defeating the third. In one week President Trump confirmed that his first concern is the United States, that he has what may be a workable vision for its place in the world, and he loathes globalism and the globalists. A good measure of his efficacy is the outrage he generates. By that measure, that week was his finest hour... so far. Europe won’t have a seat at Trump’s great-power table. Its welfare states are addicted to their handouts, deeply in debt, rely on uneven trade arrangements with the US, and have below-replacement birth rates. They are cowed by Soros-sponsored propaganda—Immigration is the answer!—and haven’t shut off the immigrant invasion. Refusing to spend on their own militaries, they’ve used what they save on defense to subsidize welfare spending and state bureaucracies. They’re ignoring a lesson from history: nations that rely on other nations for their defense generally come to regret it. Instead, they’re wedded to the globalist acronyms: NATO, EU and UN. They have frittered away their power and their glory—Europe’s heritage and civilization—opting for overrun masquerading as assimilation by dogmatic and implacable foes. Trump is all about power and despises weakness. There isn’t always strength in numbers. A confederation of weaklings doesn’t equal strength, especially when the weaklings’ premises and principles are fundamentally wrong. Strongest of the weaklings is Germany, a trade powerhouse but a US military vassal. It’s hard to say if Trump’s dislike of Angela Merkel is business—she’s one of the world’s most visible and vociferous proponent of globalism, or personal—it’s always her way or the highway. Probably both, and it looks like Germany may finally be rejecting her way on immigration. Trump clearly relished snubbing her and her G-6 buddies, particularly boy toys Trudeau and Macron, who may actually believe his bone-crushing handshakes intimidated Trump. When you’re paying for a continent’s defense and you’re giving them a better deal on trade than they’re giving you, that’s leverage, and Trump knows it. He’s not intimidated. US Atlanticists have used that leverage to cement Europe into the US’s confederated empire. That Trump is willing to blow off Europe suggests that he may be blowing off empire. America’s imperialists equate backing away from empire with “decline,” but such a sea change would be the exact opposite. Empires require more energy and resources to maintain than can be extracted from them. They are inevitably a road to ruin. Nothing is as geopolitically telling as Trump leaving Europe’s most “important” heads of state early to meet with the leader of one of Asia’s most impoverished backwaters. Europe’s time has passed, the future belongs to Asia. Barack Obama’s “pivot” to Asia may look like the same recognition, but it was not. That pivot was designed to encircle China diplomatically, economically, and militarily. That thinking persists among much of the US military, but Trump may have something different in mind. China has its problems. Much of its economy, especially its financial sector, is state-directed, despite the capitalistic gloss. There will be a reckoning from its debt binge. The repressive social credit system typifies the government’s immoral objective: keeping China’s people compliant but productive drones. However, enforced docility and innovation—the foundation of progress—mix as readily as oil and water, and theft of others’ innovations can’t fill the void. Notwithstanding its issues, China is a major power and is not going to be encircled or regime changed by the US. The Belt and Road Initiative (BRI) it cosponsors and finances with Russia is the centerpiece of a basket of initiatives designed to further those countries’ influence and leadership within Eurasia and among emerging market countries. BRI is an apt symbol of the movement towards multipolarity, with competition shifting from the military to the economic and commercial sphere. Trump tacitly accepts Russian and Chinese dominance in Eurasia. However, Trump doesn’t give without receiving; he’s going to extract concessions. Number one on the list is North Korea and its nuclear weapons. We’ll probably never know what has gone on behind the scenes between Kim Jong Un, Xi Jinping, and perhaps Vladimir Putin, but Kim may have received an offer he couldn’t refuse. Both China and Russia would be well-served by a Korean peninsula free of nuclear weapons and US troops. Whatever transpired, Kim came around. Trump ameliorated any potential humiliation, journeying to Kim’s neck of the woods, laying on an inspirational movie video, and flattering the North Korean leader and his country. Kim the farsighted leader may be able to reach a deal; Kim the browbeaten puppet couldn’t. If he tried, he’d probably be deposed, always a danger for dictators. As global competition moves from military to economic, Trump is also going to make sure he tilts, as much as possible, the rules of that competition back towards the US. There are the existing trade arrangements with Europe, Canada, and Mexico that he’s willing to blow up, presumably to obtain better arrangements. China is in a league of its own when it comes to gaming trade, and it’s getting the Trump treatment as well. Much of the Chinese “advantage” stems from Chinese overcapacity, fueled by below market interest rates in China and around the globe. Trump can’t do much about that “advantage.” The low-interest regime will eventually crash and burn, but it’s going to take a depression to clear overcapacity in China and elsewhere. Innovation and intellectual property are America’s one indisputable comparative economic advantage. It will be a tough nut, but Trump is bent on curbing China’s acquisitions, by fair means and foul, of US know how. If he succeeds it will slow, but not stop, the Chinese economic juggernaut. It has millions of smart, well-educated, industrious people who will continue to fuel indigenous innovation (notwithstanding state-enforced docility). Three realities confronted Trump when he assumed office. The US empire is unsustainable, so too is the trajectory of its spending and debt, and the government is fundamentally corrupt. It would be foolish to bet Trump doesn’t understand these issues and the linkages between them. If Trump has recognized that first reality and is implementing Don Corleone’s spheres of influence concept, he may get some breathing room to address the intractable second and third realities: the trajectory of US spending and debt, and the fundamentally corrupt government. On the debt, all the breathing room in the world isn’t going to save him. The US keeps adding to principal, which is compounding at rising rates. Cutting imperial expenditures would help some, although transfer payments are the biggest enchilada. To make even the first step on the thousand mile journey to solvency, however, the US government will have to run a bona fide surplus for many years. That prospect is not on the horizon. As for corruption, thousands of articles by bloggers and commentators, including SLL, may have less instructional value for the populace at large than one simple demonstration: most of America’s rulers and its captive media are speaking out against a peace initiative, not on the merits of the initiative itself, but because Donald Trump was one of its initiators. That tells those Americans who are paying attention all they need to know about their rulers and their captive media. Whether they do anything about it is another question.